Part of the infantry of the New Zealand Expeditionary Force (separate from the Auckland Regiment of the New Zealand Territorial Force). The Auckland Infantry Regiment in the NZEF was one of four regional infantry groupings (along with Canterbury, Otago and Wellington) which made up the bulk of New Zealand’s infantry forces during the First World War. It served as the Auckland Battalion at Gallipoli in 1915 before being divided into 1st Auckland Infantry Battalion and 2nd Auckland Infantry Battalion in March 1916. An additional battalion, 3rd Auckland Infantry Battalion, existed between March 1917 and February 1918. 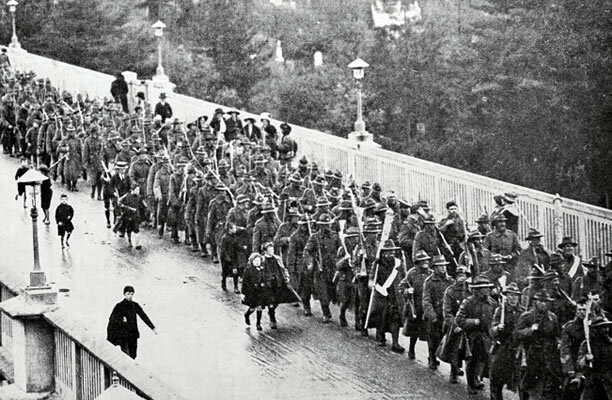 The regiment served on the Western Front from 1916 until 1918. Cloth patches for the (l to r) 1st, 2nd and 3rd Battalions of the Auckland Infantry Regiment. Cloth patches sewn on the backs of uniform jackets from October 1916 identified which unit – or part of a unit – an individual belonged to. These are the patches of the three Auckland battalions serving on the Western Front. A fourth (reserve) battalion was based at Sling Camp in England. Shoulder title worn by all infantry units (‘New Zealand Rifles’) except the New Zealand Rifle Brigade. All New Zealand infantry units wore red-striped puggarees (felt hatbands) on their caps. 3rd (Auckland) Company. Cap badge: Within a wreath and circle surmounted by a crown, a mailed arm holding a sheaf. The circle inscribed ‘3rd (Auckland) Regt N.Z. Infantry’. Collar badges: Similar to centre of cap badge, in matching pairs. Above a scroll ‘3rd (Auck) Regiment N.Z. Infantry.’ Unit motto: Sisit prudentia (Ever prudent). 6th (Hauraki) Company. Cap and collar badges: A lion within the garter on an eight-pointed star above a scroll bearing ‘Hauraki’. Unit motto: Whaka Tangata kia kaha (Be men, be brave). 15th (North Auckland) Company. Cap badge: Regimental number between fern-fronds within a circle with ‘Pour Devoir’ and ‘North Auckland’ and surmounted by a crown. Collar badges: Smaller version of the cap badge. Unit motto: Pour devoir (For right). 16th (Waikato) Company. Cap badge: An arm grasping a taiaha within a fern wreath and surmounted by a crown. Collar badges: An arm grasping a taiaha above the regimental number and motto. Unit motto: Ka Whawhai tonu ake ake (We shall fight forever and ever). The Auckland Battalion was divided into 1st Auckland Battalion and 2nd Auckland Battalion in March 1916, with the second battalion comprising a new set of companies with the same names as the first. A third battalion, the 3rd Auckland Battalion, existed from March 1917 until February 1918. The Auckland units drew their recruits from the Auckland military district, which encompassed the Far North, Auckland city, the Waikato, much of the King Country, and the Bay of Plenty. As far as possible, each company drew its recruits from its geographical region until September 1917. From then on, men were sent overseas as generic infantry reinforcements but were still generally assigned to their region’s unit. The four companies were NZEF counterparts of the regional Territorial regiments created in March 1911. They adopted the identifying badge of the corresponding Territorial unit. Each regional infantry company had its own distinctive cap and collar badges (the cap badge is shown in the centre of each photo). They continued to be worn by the Auckland companies after the second and third battalions were formed, with cloth patches signifying which battalion they belonged to. Unit diaries for all the Auckland Infantry battalions are held at Archives New Zealand. A digitised copy of the Auckland Battalion unit diary (April-July 1915 only) is available on the Australian War Memorial website. We have 19 biographies, 40 articles, related to Infantry units.